I came across this story yesterday and was instantly inspired. It made me smile and so I thought I would share. "A 99-year-old greeter may be Nordstrom's best asset"
Ted DiNunzio is 99 years old and is a greeter at the Nordstrom located in the Santa Anita Mall, in Southern California. 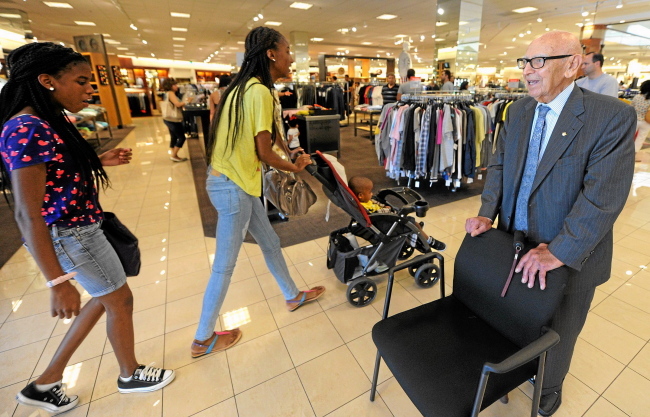 Ted was hired 13 years ago at the age of 86 and is the only greeter employed by Nordstrom (a department store with locations around the country). . Shoppers often stop by just to see Ted. "The simplest thing you can ever do is be nice to people. Always be nice to people and smile. And they'll come back." Words from a man who makes an effort to put on a suit and drive himself to work every Friday and Saturday. Most people can't wait to retire, so that they can do nothing, but doing nothing is not good for the body or the brain. I really hope to have good health to allow me to do something like this at the age of 99!